Mike Brey knew it would be a great early-season test — and potential confidence boost — for his young team Wednesday night against No. 19 Michigan State. It was both for a Notre Dame squad that supplied answers all night en route to a 79-78 overtime win at a nearly sold-out Purcell Pavilion. 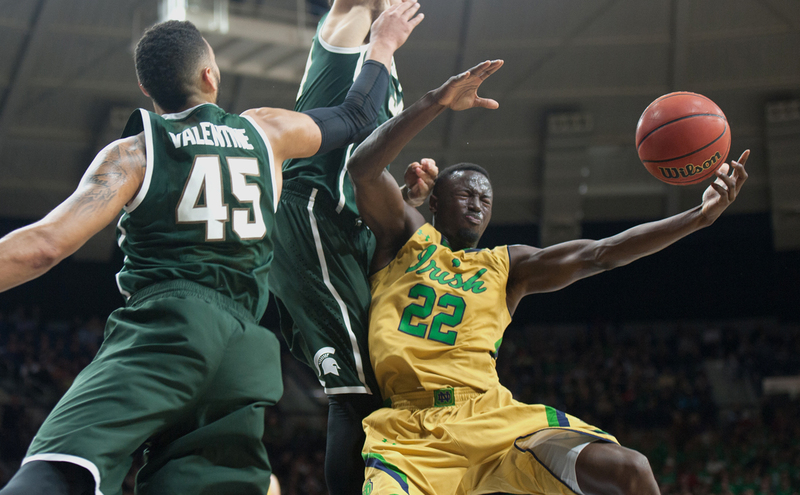 Irish senior guard Jerian Grant battles through traffic during Notre Dame’s 79-78 overtime win over No. 19 Michigan State on Wednesday night in Purcell Pavilion. Grant led all scorers with 27 points. Brey went on to praise Notre Dame’s physical and mental toughness — those which powered the Irish through 45 minutes of high-end basketball. Notre Dame (7-1) hit threes. The crowd bopped on its toes. The “Noise Meter” rose, and “LOUDER” vibrated on the courtside screens. And the Spartans (5-3) responded — again and again. Junior guard Bryn Forbes did most of the honors with crowd-quieting 3-pointers and nimble floaters, but senior forward Branden Dawson and junior guard Denzel Valentine did their parts too in warding off Notre Dame. Still, Notre Dame stayed alive. The Irish forced overtime with some key defensive stops, then won it in the extra stanza with more of the same — and a healthy dose of senior guard Jerian Grant and sophomore guard Demetrius Jackson. Grant (27 points) and Jackson (22) each notched career-highs. “I think I’ve got the best backcourt in the country,” Brey said. That backcourt, plus 12 points from both senior guard/forward Pat Connaughton and sophomore guard Steve Vasturia and constant energy from sophomore forward Austin Torres, drove the Irish to their first marquee win. “For the most part we executed at key times, which we didn’t see much of last year,” Connaughton said. Valentine held the ball in the final five seconds of regulation with the score tied 67-67. He drove right, but Grant stood him up. Valentine dribbled off his foot, and it went back to the Irish. “It was definitely something I needed — mano y mano — I knew it was going to be one-on-one,” Grant said. At the other end with two seconds left, Grant got a look at the basket but fumbled it on the way up after a nudge from Valentine. “It’s a play I should have made,” Grant said. Brey trotted out the same five for overtime, as Torres took — and won — the opening tap. The sophomore from Granger, Indiana, whose previous career-high in minutes was 11, played the final 13:08, including overtime, as junior forward Zach Auguste rode the bench after tallying four points and four rebounds in 19 minutes. Torres was tasked with defending Dawson and limited the athletic specimen to two points over those last 13 minutes. Torres’ only basket — an overtime tip-in — slid the Irish ahead 71-69. Then Jackson delivered a filthy crossover and finished an and-one at the basket to stretch the lead to 74-69. Notre Dame’s defense finished the job. The lead changed hands 11 times and the score was tied on nine occasions. Despite Michigan State’s commanding 43-26 advantage on the glass, Notre Dame’s offensive efficiency (just four turnovers) and overall defense, especially shoeing the Spartans away from the 3-point line, proved enough for the Irish. After a high-octane and energized first half that featured three ties and nine lead changes, Notre Dame trotted into the locker room with a 37-35 edge. The Spartans broke open a seven-point lead with 11:16 to go in the first half, a surge highlighted by a one-handed slam by Dawson, but the Irish kept battling. Before the game, Notre Dame announced sophomore forward V.J. Beachem is out for a month with a right foot injury (plantar fasciitis) suffered in practice Tuesday. Brey said Torres solidified his role in Notre Dame’s rotation and added they hope to get Beachem back practicing after Christmas. Following an off day Thursday, Notre Dame returns to practice Friday before hosting Fairleigh Dickinson on Saturday at 8 p.m. at Purcell Pavilion.